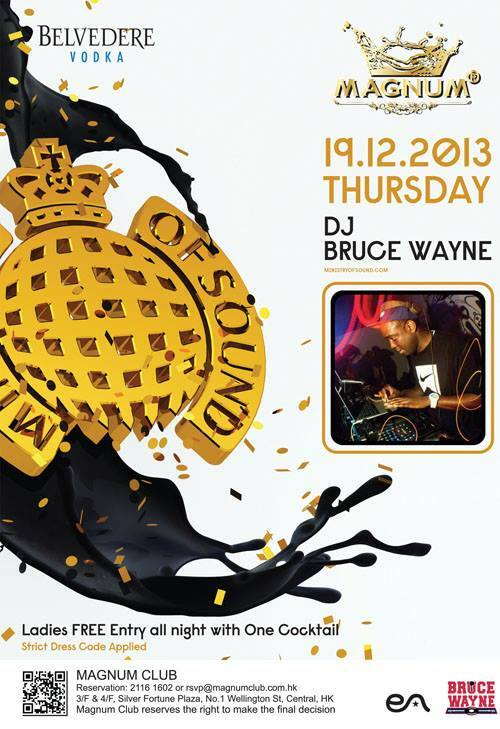 Magnum Club is proud to welcome Ministry of Sound with DJ Bruce Wayne on Thursday 19th December 2013! A versatile DJ who is especially attracted to the art of turntablism; DJ Bruce Wayne has started his craft ever since the age of 12. Well known for the numerous performances he has done in his hometown London, UK and around the world; he is recognized by his wide selection of music genres, attracting crowds of different music tastes at ease. Be a part of the crowd to see this talented DJ live exclusively at Magnum Club on the 19th of December! Venue: Magnum Club, 3 & 4/F, Silver Fortune Plaza, 1 Wellington Street, Central, H.K.